Q: And when you say ‘The Pit’, we’re talking about the lower room down in the old North Fieldhouse, right? Where they used to store the blocking dummies? JW: Yeah, we used to live down there! Q: I’m sure you can still hear Charlie yelling to this day? JW: Oh, he was just screaming. Us O-linemen, we were pretty much chilled, you know? But the D-linemen, they were in there screaming and hollering about how they were gonna get after us, and when they came in there it would get heated. Coach Tenopir definitely wanted to get after it, but he didn’t do all the screaming like the defense did. Q: Do you recall some choice words Charlie used? JW: He wasn’t afraid to cuss. (laughs) Maybe that’s why we were down in the pit, I think, because that way Coach Osborne wouldn’t get to or have to hear them cuss. I never heard him say a swear word for five years. Q: Charlie made up for it? JW: Oh, yeah. (Laughs) Coach Steele was intense, too. I remember one day when I was a redshirt, he pulled me over to work with the linebackers and we had to do a one-on-one drill. He had us 10 yards apart and he had us come off the ball and go full speed, taking on the linebackers. And I’m the only guy over there and I had to take on 10 linebackers by myself, just getting my bell rung. And I remember him just screaming, “Come on, Wilks!” I’m like, ‘Dude, are you kidding me?’ All these guys were getting rest and I’m the only one. And we were on scout team going against the defense and if we were slacking he’d come into the huddle and grab our facemasks and shake us around, bumping up against us and pushing us around. That guy was catch, yeah. I never became really tight with him. He was pretty intense. I just remember always being kind of intimidated, he had that crazy thing going for him, too, where he could snap. Q: Any memorable games stand out to you? JW: Of course, that Orange Bowl is the one I’ll always remember the most. There’s two games that I played the best in. When we played Colorado my senior year and we beat them at home, I had a good game there, had a few pancakes on Ted Johnson, he ended up being in the pros. And we were always competing for the most pancakes, that was a big deal, seeing at the end of the year who had the most pancake blocks. And against Oklahoma State I had 19 pancake blocks, the most ever, so I remember that game. But definitely the Orange Bowl against Miami was a game that sticks out. Q: What about that game? JW: Just the guys we were going against: we had Ray Lewis on my side, Warren Sapp on the other side. Also, the year before against Florida State -me personally- I didn’t have my best game and didn’t play that well, so the next year coming back I wanted to do better. And Coach Tenopir said I had a really good game there, so that really was great to hear, and that sticks out. Q: You switched from your normal left guard position to the right side for that game, right? JW: Yeah, that was a coaching decision, Coach Tenopir and Coach Osborne. At the time I was pretty pissed about it, because they wanted Brenden against Warren Sapp, and he’d been tearing people up all season. Brenden and Zach over there, our two All-Americans, it kind of pissed me off at first and it was kind of an insult, but looking back -weeks after making that decision- I respected that. It was probably more embarrassing more than anything for a short while, more of an ego thing, having to tell people why we did it when they would ask me, you know? Like I wasn’t good enough or something. Sapp was a good player, and if they wanted to put a good player like Brenden on him, I respected that. But I wanted to prove myself, so that motivated me for that game, too, and I wanted to show them that I could take him on, too, and I chop blocked him a few times and smacked him around pretty good, so I had my three or four traps on him. Actually that last touchdown by Cory, I trapped him. And that was my only game on the right side. Q: So you were dealing with a lot of things. What or who else were you dealing with that game? Was Dwayne Johnson, “The Rock” over there? JW: Yeah, they had some big names on that defense, so it was pretty cool. Q: What about interaction with some of the other guys? A lot of banter back and forth? JW: Yeah, there was a lot. I thought the year before, Florida State was the team that talked the most at that point, but Miami was even more so. Warren Sapp, for sure, he talked the whole time. Ray Lewis, too. Those guys for sure, also Marley, little Marley. Oh God, he talked so much. He was so tiny, but he talked so much! Q: What would he say? Q: So the ’94 Orange Bowl, the Florida State game, how much did you play during that game? JW: I rotated in that game. Rob Zatechka and I rotated in and we’d alternate. We’d go two series and alternate. I played left side and played half of that game. I was injured early my junior year so I didn’t play until halfway through the season, so that was really the biggest game I’d ever been in, for sure. I was pretty nervous, played alright, but I made mistakes and stuff. It was kind of tough to take at the time. Q: Was there a different intensity that game compared to a regular-season game? Q: Could you give us a scale of magnitude in comparing that one? JW: It was a ten. That and the Miami game were the most intense games I ever played in. That year we played Pacific, and I would give that a minus 2. I played half the game and remember eating a hotdog on the sideline during the game. (laughs) We were eating on the sidelines and Coach Osborne didn’t think that was too cool, so we got in trouble for that. It was Zach Weigert’s idea, so we blamed Zach. Q: Do you recall that Florida State game with Zach at the end there giving the Florida State guy a hard time for cursing at Coach Osborne? JW: The last series I wasn’t in for the kick, I was on the sidelines. I remember more of Byron Bennett and how nervous he was on the sidelines. I wasn’t very confident seeing his body language there on the sidelines. He was kind of saying, “I don’t think I can make it. I don’t think I can make it.” And I was like, ‘Are you kidding me? What are you talking about?’ He was pretty negative, you know, so I didn’t think we had much of a chance after seeing that. It was too bad, but that’s what I remember about that last part of the game. Q: Any one significant play stand out to you. A matchup? JW: The biggest play my senior year was that pancake on Ted Johnson. I’ll never forget that play pancaking him. Coach Tenopir put in a special play -we hadn’t run it at all the entire season- for me to pull around. Everybody was gonna wash everything down and I was gonna pull around, and the last second I saw his eyes get all big and just got underneath and drove him, picked him up and slammed him on his back. Executed the perfect pancake you dream about. One of those kind of deals. It was the first touchdown. Schlesinger scored the first touchdown. Q: I’ll have to go back and look for that. Any other funny stories worth sharing? JW: A lot of them. Just a lot of horsing around. For me, we were living in the dorms for a couple of years. I remember one time Matt Shaw and Tom Seiler (I had one of those Suzuki Samurais that didn’t have the top on it), Shaw and Seiler stole that thing off the top of my rig and it started to rain, and I was freaking out trying to find where it was. They had me running around all day long searching for it, giving me hints about where it was, running all over campus trying to find this thing. I was freaking out, worried I was going to ruin my interior and everything. So finally I called Shaw at his home. I’m just pissed and I’m just cussing and yelling at him, and he says “Hey Joel, say hello to my Mom. You’re on speakerphone right now.“ He had it on speaker phone and his whole family was having dinner over there. And his Mom is a real nice, religious lady, very proper, and she says “Hi Joel.” And I’m just like, ‘Awwww!’ I couldn’t believe it! I was so embarrassed, man. We’d be cracking jokes like that, always doing stuff like that. JW: The things I remember most from practice is the fights. Some were pretty funny. Like one time I was on scout team -and again, that’s when I was getting in all those fights– well, they set this thing up with Parrella and Raemakers, they were just tired of me getting in fights and stuff. So they grab me -and this was a bowl game practice- right at the end of the play everybody was watching, and they were just pounding on me, swinging, both of them just swinging and I’m just covering up and they‘re pounding on me and they’re just laughing. Giggling and laughing while they’re doing it! And I remember looking over at the scout team and those guys aren’t helping me. I’m thinking, ‘What the heck are you guys doing?! Aren’t you gonna help? !’ (laughs) I was pissed. 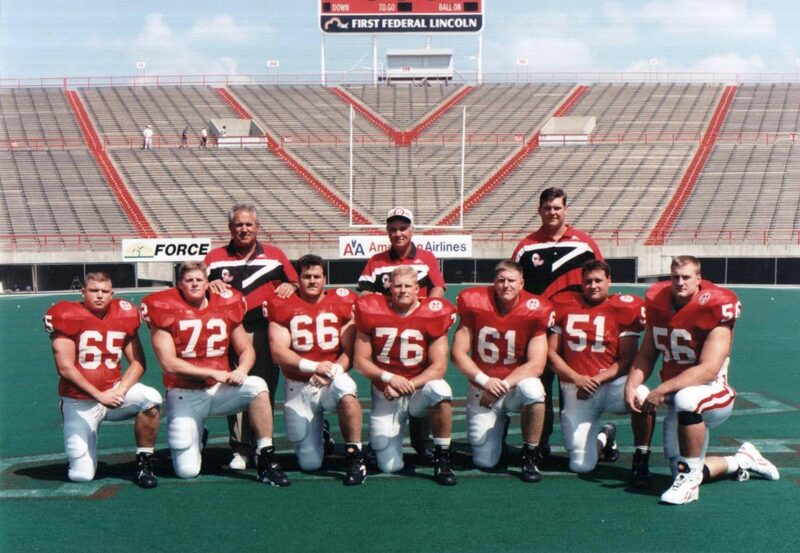 That, and I got into fight once with Christian Peter in practice and Coach Osborne pulled us aside and made us run stairs for about 45 minutes in South Stadium for that. Christian and I are running looking over at each other and Christian is dropping f-bombs, calling me an eff-ing pig, saying that and chewing me out, in a fun way. It was funny. And that one time I was so sick and Brenden and Aaron getting in my face that day and chewing me out that day. I remember that, It was awesome. Q: And Joel, what kind of feedback did you guys get? Next day? JW: Yeah, next day we would go over the previous day’s practice and go play-by-play, position-by-position, every play every practice. For games they grade you: zero, one and two. A number, then you get a score and then pancakes. You were always getting graded, always getting looked at, always getting coaching. It was huge. Q: Do you recall who led that senior year in pancakes? JW: I did. Yeah, one hundred and forty -two. Q: Do you recall who the closest guy was to you? Q: What did the Pancake King get? Was there a prize? JW: No, it was bragging rights, is all. We all really wanted it bad, though. We did take a picture. I remember, at the training table where all of us were sitting at a table eating pancakes, and they put me right in the middle, in the center with this big stack of pancakes in front of me, so I guess since I was the champ I got to sit right in front of the huge stack. (laughs) Best seat at the table. Q: What would you say you were most proud of? JW: I was just proud of, I guess, the path I had to come up: to get there and how it finished. The story couldn’t be written any better, it was a dream come true. How it turned out for me, to walk on and come up through the ranks and end up starting and then winning the national championship. Every day, one day at a time, it was how I approached it, my work ethic and being consistent every day. And being only 230 lbs. when I came in, it took everything I had to get to that weight and that level. Just the consistency every day, coming in and doing the work. Getting to that level was a dream come true. Q: The process of becoming the player you wanted to be? JW: Sure. Coach Osborne always stressed the process and the journey, you know? It was just doing the right thing every day, and it paid off. Q: Wish you could do anything over? JW: I’ve never really thought about that before. Wow, that’s a good question. You know, not really. Like I said, I felt I did everything I could, maybe I wished I could have been an All-American. I never had a dream to play in the NFL, but it would have been nice to have a chance, at least. You know, I did everything I could every single day and it wasn’t in the cards. It wasn’t like I came out of the womb a 13 lb. baby like Brenden. (laughs) I wasn’t as naturally gifted, as far as my frame and that kind of thing. I think I got everything out of my career and my body. I’m pretty satisfied with how everything turned out for me. I don’t really have any regrets. Q: And if I recall, was the CFL after you? JW: Yeah, they were. I told them I was gonna come up there, but a week or two before camp, I just didn’t have it in my heart. I felt like the days were over, I played my best game and we one the national championship. And I didn’t want to linger on and play in all these different leagues and get injured. And I felt pretty satisfied with where I was, and I realized that if I wasn’t gonna get any chance in the NFL I was gonna call it a career. The same thing like my college choice, if I wasn’t going to play at Nebraska I wasn’t going to play anywhere else. I wanted to give it a chance to play at the ultimate place, if it wasn’t there then I didn’t want to play. Same with the NFL. So I changed my mind and started up the diet plan, dropping weight. So here I am. Q: How heavy did you get? JW: My heaviest was about 285, I usually played during the season at about 275. I always wanted to get to 300. I would sit there at the training table, you can ask those guys, they’ll tell you. I would be sitting there for two and one half hours, trying to eat. I’d go through like 3 or 4 groups of guys sitting at my table. (laughs) They’d keep rotating by as I sat there and ate. That was surely my way of trying to get to 300, I guess. Q: Sounds like you were a table centerpiece. Everything moved but you. (laughs) You were a fixture. Q: Any personal thing, a saying or something that you could stick to on a bad day to get you through? JW: Oh yeah, Brenden and I had this thing where we would put a piece of tape across our helmets, and we wrote ‘PMA’ on it. And other guys would go, “What the heck does PMA stand for? !” We used to have deep and meaningful talks about stuff, about life and practice and that type of thing, and Brenden came up with it. Like one time, when my girlfriend and I broke up during college, I was talking to him and he kind of helped me through that. And it was PMA, Positive Mental Attitude. And that got us through a lot of bad times, just motivated us, you know. Through bad practices and stuff. We always said, “PMA.” Even though the tape came off the helmet, we’d still say ‘PMA’. Look at each other and say ‘PMA’, it would get us fired up, you know. Q: Were there any PMA’s going around on that final drive for Cory’s last touchdown drive against Miami? JW: Oh yeah, one thing we also did, kind of a thing that would bring each other up. Whenever we were in the huddle and really needed a big play, really needed to come together and get something done, Aaron Graham would always lean over and reach down and grab us by our shins, our calves, the front of our legs, and all of a sudden it became a big deal where we always called it the ‘calf grab.’ All the times we needed a big play, for big games, he always would reach down and do that. And it kind of re-energized us and got us so jacked up. I remember him doing that on the final drive, on that last play where Cory scored there in the Orange Bowl. He didn’t grab them the year before and we didn’t get it done, so he did that and we ended up scoring on the next play. To this day, every now and then we’ll be talking and if you sense a guy is down or something you say, “Hey man, do you need a calf grab or what?” It’s kind of special what we all had there.